MIUI 8 is the biggest update released from Xiaomi ever. For people who are not familiar with the Xiaomi OS and phones then I should tell you that MIUI 8 is a software based on Android 6.0 Marshmallow. This update comes with TouchWiz improvements, new Material functions, Doze for better battery life, App Standby, Applications Permissions controls, and tons of new features and tweaks that should improve the overall performance of your Xiaomi phone Xiaomi Mi 5. 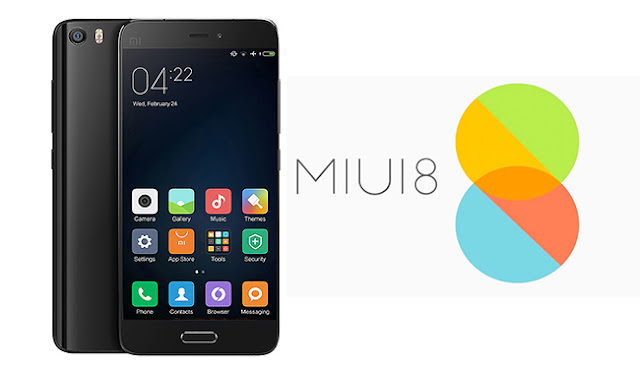 So, if you have own a Xiaomi Mi 5 and now you’re interested to update it to MIUI 8 then you’re in the right place. However before starting the guide how to update Xiaomi Mi 5 to MIUI 8 you should check some requirements from the list below. Use this guide only with the Xiaomi MI 5 devices. Do not attempt to flash the ROM which can be found from below on any Xiaomi or Android phone. Enable USB Debugging and OEM Unlocking from Developer Options. Make sure you have installed Xiaomi Mi 5 USB drivers on your PC. Read the entire article and do not skip any steps. Download MIUI 8 for Xiaomi Mi 5 (Marshmallow) from their official page here! After the download is finished you should copy the zip file to the SD Card of your phone. disconnect your phone from PC when the the file has been moved. Now, launch a tool which is pre-installed on your Xiaomi Mi 5 named Updater. Tap on the menu key and there will be displayed an option named Select Installation File, Tap on it. Now, find the transferred .zip file that you have move from PC on your phone. When you’re ready tap on the update button. In the end, just wait for the installation process to be completed. then chose the reboot option. Now you’ve learned how to update Xiaomi Mi 5 to MIUI 8 Marshmallow. If you have any questions do not hesitate to use the comments box.